This is an advertisement for Gilles and Hunboldt’s Noiseless Atmospheric Gas Engine which was used for driving hoists, pumps and machinery. Britain in the late 19th century was a world leader in the development of technology. Between 1791 and 1860 nearly fifty patents were taken out in England for gas or vapour engines. Only a few of these actually worked however and it was not until the 1860s that mechanical difficulties were resolved and a working commercial engine could be constructed. 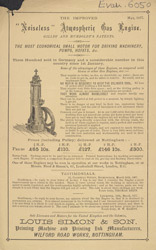 This leaflet features an illustration of the engine as well as list of prices and some testimonials.